While students look to the sun for warm weather, Lylburn Downing Middle School is looking to the sun for electricity – and to teach its students how that works. In June, the Lexington City School Division contracted a Staunton-based solar energy company, Secure Futures LLC, to install a solar panel array on the roof of Lylburn Downing. The school division hopes to save money on cheap and clean electricity while educating students about solar power. The school is participating in Secure Futures’ Solar Schools Initiative. The initiative leases roofs of school buildings and puts solar panels on them at no cost to the school. The panels are still owned by Secure Futures, but the electricity generated by the array is sold to the school at a reduced rate. The system is expected to save the Lexington school division between $3,000 and $5,000 annually, according to Matt Ruscio, program and policy advisor at Secure Futures. The solar array will include about 295 panels, said Ruscio. It is projected to generate 110,000 kilowatt-hours of electricity each year, which supplies roughly a quarter of the school’s needs. Construction is set to start in May on a rooftop solar installation at Lylburn Downing. “If they [the schools] wanted solar energy and they wanted to directly purchase the system, they’d be expending $250,000 up front and that is something that a K-12 school… [doesn’t] have,” Ruscio said. The Solar Schools Initiative began in June with six public schools in Albemarle County. Lexington City Schools is the second division to jump aboard. The motivation comes from increasing awareness about the need to protect the environment, said Lexington City Schools Superintendent Scott Jeffries. “Even a small school system our size, we can do something,” he said. Beyond just saving the division operating costs, the project will also minimize Llyburn Downing’s carbon footprint. The solar energy will offset about 80 tons of CO2 annually, Ruscio said, about the same amount generated by the coal needed to power 10 homes. The education part of the project features a “Solar Spotlight:” a 20-foot tall structure holding six solar panels with USB ports for students to charge their electronic devices and LCD screens to show students the benefits of solar energy. The structure also provides a seating area and shade for students. Jeffries hopes that the school will be able to use the spotlight for various science experiments and educational opportunities, such as measuring how long it takes to charge different devices and how much energy cell phones and computers use. “We plan on having a screen that shows the work that is being produced from our solar panels, how much we’re saving, the output; kind of a transparent, educational component as well,” said Jeffries. The solar array will create minimal aesthetic disturbances to the school and will not require massive renovations, said Ruscio. “They [the panels] will just simply rest on top of the roof. They will be weighted down, so that obviously the wind doesn’t blow them off, but there are no roof penetrations so they are just kind of sitting on top of the roof,” said Ruscio. 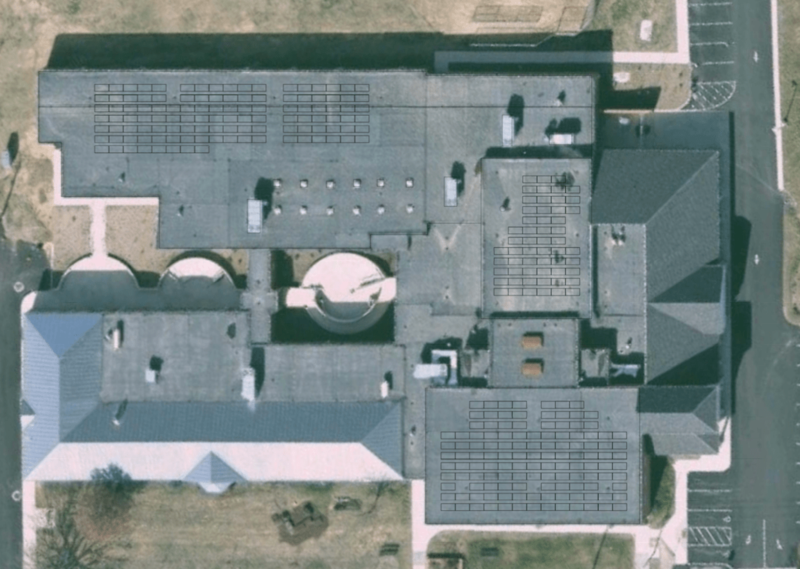 The school division originally considered installing the solar array on Waddell Elementary School, which is still under construction, but the school board ultimately decided that Lylburn Downing ’s location and its height make it a better fit, Jeffries said. The solar panel array has an expected service life of about 35 years, but Lexington City School’s contract with Secure Futures expires in just 20 years. After that, the division can decide whether to buy the array, renew the contract or have the array removed. Installation of the solar array is set to begin in May and be completed by August.